If things go according to plan, that line will break out of the realm of movie trailers and video games and become an actual reality that you will be able to attend at your local sports arena. When it does, you’ll have MegaBots to thank for making it happen. A MegaBot prototype robot firing a paintball. Courtesy S.N. Jacobson. 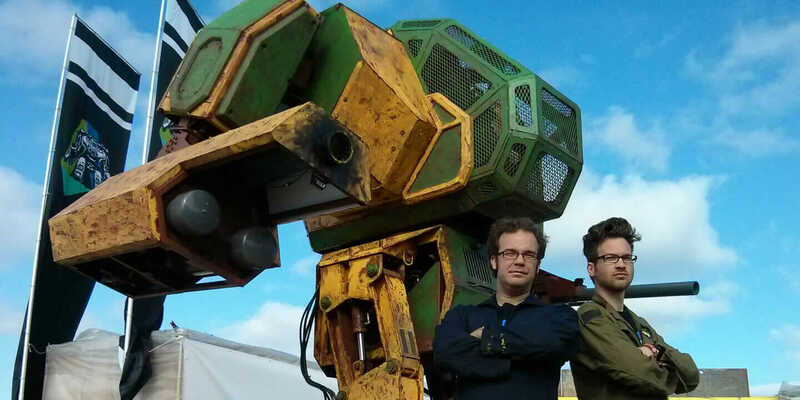 While movies such as Pacific Rim, Real Steel, and The Matrix have shown battling robots with humans inside controlling them, MegaBots cofounders Matt Oehrlein and Gui Cavalcanti say their impetus to make robots battle predates modern movies. 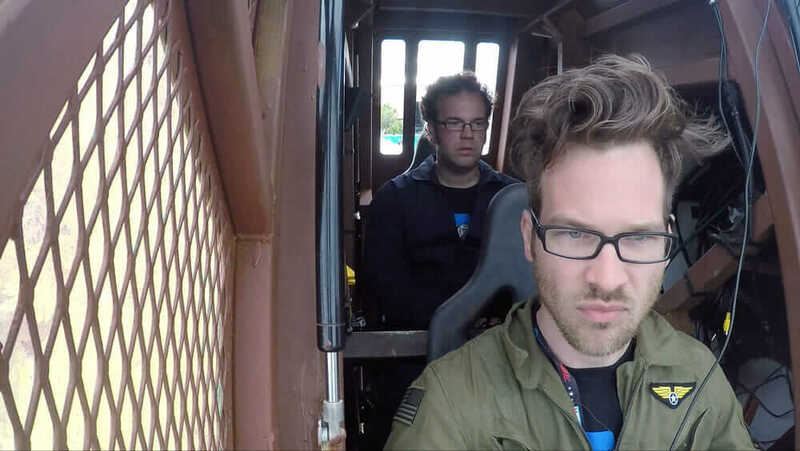 Oehrlein and Cavalcanti are in the early stages of creating MegaBots, in which 15-foot robots (with two-person teams inside of them) will shoot softball-size paintballs at each other until paint-splattered losers crawl out of a defeated robot while the audience cheers the robot and team that remain standing. That reality is at least two years away, though. Cavalcanti works on an independent project with a company he cofounded called Project Hexapod, which is a 6,000-pound, six-legged robot that seats two people, powered by a 100-horsepower forklift engine “that was meant to walk in parades as a show-pony sort of robot.” Before Project Hexapod, Cavalcanti worked for Boston Dynamics, which was acquired by Google, on a 1,200-pound robotic pack mule called LS3. 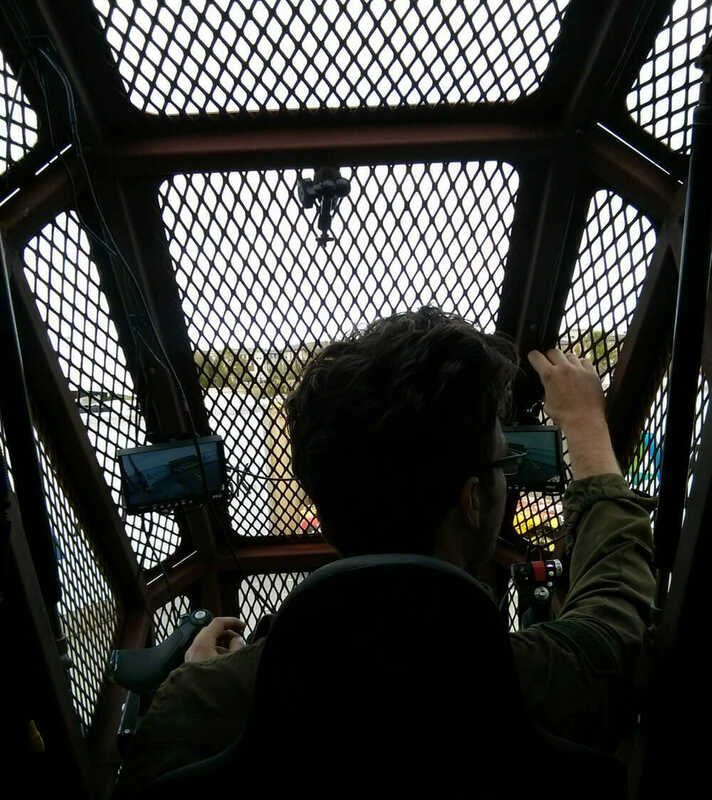 Gui Cavalcanti (back) and Matt Oehrlein (front) inside the cockpit of MegaBot’s robot. Courtesy MegaBots, Inc.
Oehrlein says their paths leading to MegaBots just sort of fell into place. Their prototype robots build on their past experience combining basic actuators and valves from construction equipment with high-end sensors to tell the components what to do. View from inside the cockpit. Courtesy MegaBots, Inc. But all of this under-the-hood work that the MegaBots team is doing is so that competitors can focus on building cool robots without becoming robotics experts. MegaBots will tune the inner workings of a robot to the point where competitors will get a kit from which they can build their own working robot. This will free the teams up to use their creativity on building unique robots, not becoming robotics specialists. The competition itself will be similar to action figures and video games, where hits from the softball-size paintballs will result in certain actions affecting the robot. 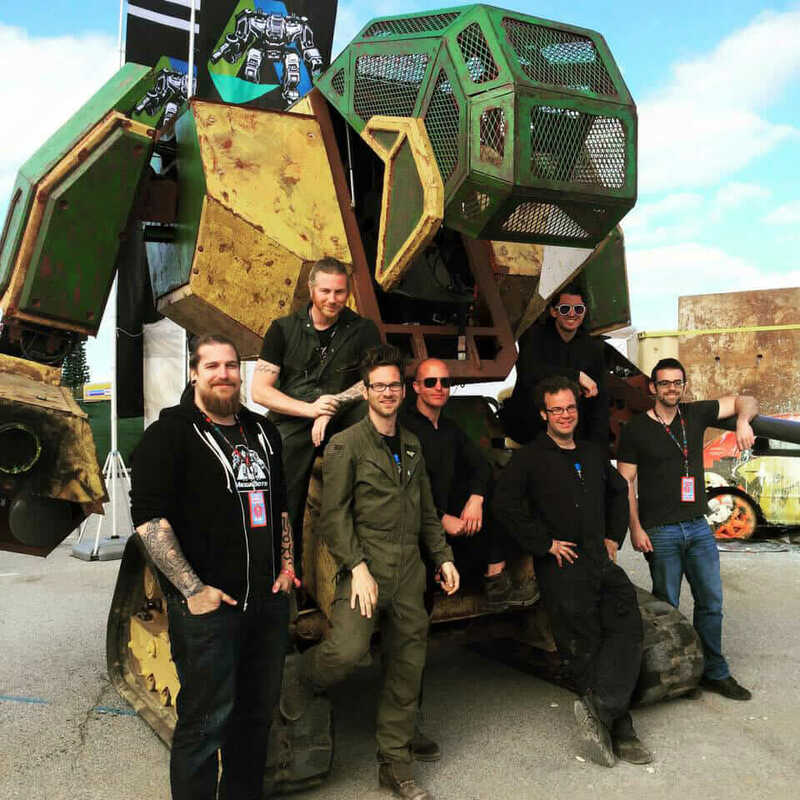 MegaBots ops team. Courtesy MegaBots, Inc. Teams interested in creating their own 15-foot robots using the MegaBots technology will be able to use cloud-based software like Autodesk Fusion 360 to create their robot’s look on top of the core kit components. “People can definitely use Fusion 360 to design for the skeleton of their robots, and how it’s going to look,” Oehrlein says, noting that they already used Fusion 360 to receive design submissions for its MiniMegaBots competition. 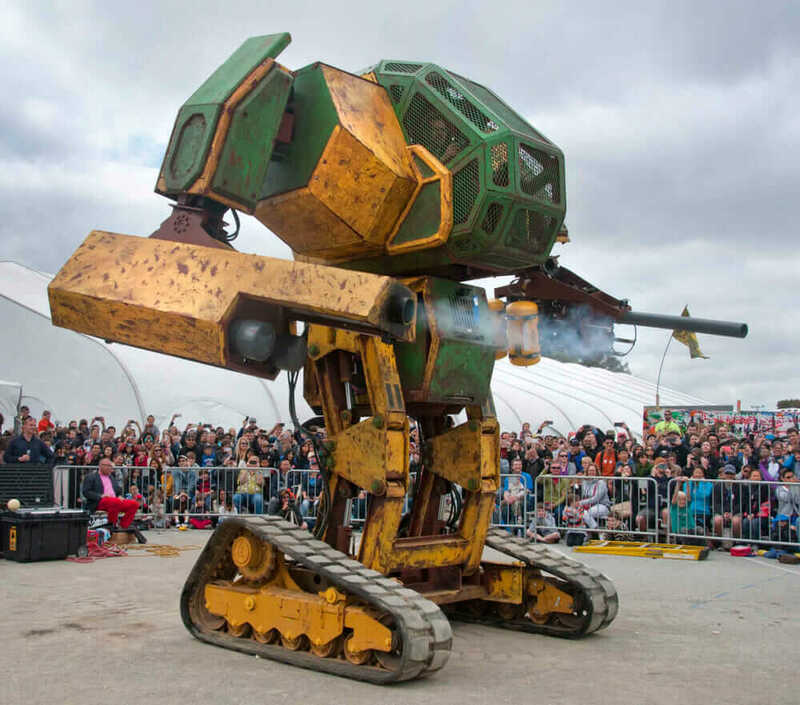 The irony of the entire MegaBots project is that they are not just building 15-foot fighting robots, but an entire sport and industry to propel this into becoming a real thing. Just this week MegaBots challenged Japan’s Suidobashi Heavy Industries (which also has a giant robot) to a duel in a viral YouTube video. “The incredibly hard technology ends up being the easy part,” Oehrlein says, because you can’t just announce there will be robots fighting and expect to sell out a sports arena. People need to go in knowing the robots that are fighting, the people inside the robots, the teams that built them, and that requires an entire narrative to be built in advance of the fight actually happening. Which begs the question of just how much fun is it to be inside of a giant robot you built from the deep recesses of your teenage gamer fantasies as you’re being pummeled by softball-size paintballs. But Cavalcanti stays on point. And it wouldn’t seem right to talk to people building giant, fighting robots without asking the obvious question about Skynet, which is how the robots took over the planet in the Terminator movies. But Cavalcanti quickly shuts down that question.